A Council for Six Sigma Certification (CSSC) Certified Six Sigma Master Black Belt is an expert in the entire Six Sigma Body of Knowledge through the execution of a DMAIC or DMADV Project. In addition, by having submitted an approved project, this individual has demonstrated a thorough knowledge of both Six Sigma philosophies and principles (including supporting systems and tools). The Master Black Belt Certification designation also reflects expert understanding of team leadership, team dynamics, and the ability to successfully assign team members with roles and responsibilities. Lastly, it signifies a master-level understanding of the DMAIC model in accordance with the Six Sigma principles, knowledge of lean enterprise concepts, and skills to quickly identify “non-value-added” activities. The Official CSSC Six Sigma Master Black Belt Certification has both an exam and project requirement. The Official CSSC Six Sigma Master Black Belt Certification exam consists of 150 questions. It is non-timed and is an open-book format examination (we encourage the use of the free Self-Study Guide issued by The Council for Six Sigma Certification while taking the exam). The Exam consists of multiple-choice and true/false questions from the major sections of CSSC Six Sigma Black Belt “Body of Knowledge.” The Official CSSC Six Sigma Master Black Belt Certification exam can be taken either online (utilizing the link below) or at designated testing centers located worldwide. The current examination assessment fee is $665.00 USD (other major currency options are available during payment). The price includes the project review fee. Applicants will have 3 attempts to successfully pass the exam with the required minimum score (see below). If unsuccessful after 3 attempts, the applicant would need to pay the examination assessment fee again. Once the exam has been successfully passed with the necessary minimum score, the applicant will need to submit 3 completed Six Sigma projects following either the DMAIC or DMADV methodology. The projects must be completely separate from any project submitted for the Six Sigma Black Belt Level II or III Certification. The project is fundamentally an evaluation of the individual’s understanding of the Six Sigma methodology and his or her proficiency in outlining and executing the necessary steps. In the past, projects required that the project be completed in a “live” business environment. However, employers are not always willing to provide the necessary resources for a project or to report financial data to an outside organization for review. It is for this primary reason, individuals can submit either a “live” sponsored project or submit a “hypothetical” project to demonstrate proficiency. If submitting a “hypothetical” project, a candidate will be graded primarily on the steps that are taken (as opposed to the actual “data” submitted). Again, the main purpose of the project is to measure a candidate’s ability to carry out a Six Sigma Project from creation to the final stages. The projects are graded by one or more Master Black Belts from our Accredited Training Provider network. All project examiners are under strict contractual Non-Disclosure Agreements to help ensure confidentiality. Projects take 7-10 business days to be reviewed. The MBB reviewing the project will be checking to see if certain “criteria” that needs to be met to demonstrate an understanding of project implementation is provided. They typically look for things like comparing possible projects in pre-planning, project charters, understanding and implementation of analysis tools, adequate control plans, etc. If the project is rejected for not meeting CSSC’s standards, candidates will be provided an opportunity to modify and resubmit the project up to 3 times (within 1 year of payment). When a project is not accepted, the candidate is informed in regards to which parts of the project need improvement before re-submission. If unsuccessful after 3 attempts, the applicant would need to pay the project review fee again. To successfully obtain the professional designation of a CSSC Certified Six Sigma Master Black Belt (CSSC-CSSMBB) issued by The Council for Six Sigma Certification, individuals must successfully complete our CSSC Six Sigma Master Black Belt Certification Exam and achieve a score of 540 points (or higher) out of a total 600 possible points (90%). Once the examination assessment fee is paid, applicants will have 1 year to successfully pass the exam. Applicants will be required to submit a signed Six Sigma Work Experience Affidavit acknowledging that they have a minimum 4 years’ experience executing Six Sigma Projects in a Black Belt Capacity (or equivalent). The projects must be completely separate from any project submitted for the Six Sigma Black Belt Level II or Level III Certifications. Individuals are expected to list in great detail the DMAIC/DMADV steps taken throughout the course of the project. Projects are reviewed and graded on a “pass/fail” basis. To successfully obtain the professional designation of a CSSC Certified Six Sigma Master Black Belt (CSSC-CSSMBB), issued by The Council for Six Sigma Certification, individuals must receive a “passing” mark within 1 year of registration (up to 3 attempts permitted). Generally speaking, many applicants submit projects that are most commonly 20-30 pages when counting supporting charts/graphs. Styles are typically well-outlined or in an essay format. There is no required general format or length for the project. However, a clear and concise plan (i.e. Project Charter, DMAIC, Gantt chart, etc.) is expected. A Six Sigma Black Belt Level III issued by The Council for Six Sigma Certification is a prerequisite for applying for this Certification. A minimum 4 years previous experience executing Six Sigma Projects in a Black Belt capacity (or equivalent) is required. After passing the requirements, individuals will receive an Official CSSC Six Sigma Master Black Belt Certification issued by The Council for Six Sigma Certification, the most respected accrediting organization in the Six Sigma industry. Individuals that would like to obtain a more recent certification date can always resubmit additional projects at any time (often for less money than a provider would charge for a “renewal”). 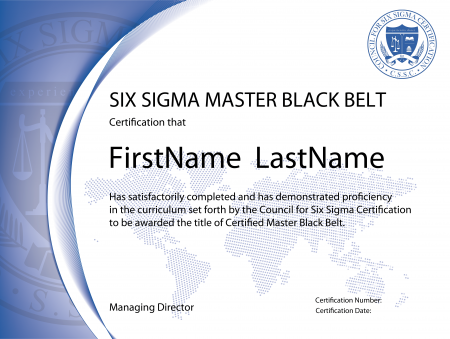 Upon completion of the requirements, individuals are issued a Six Sigma Master Black Belt Certification in an electronic form. All certifications contain a verifiable certification number and the certification holder is added to the Council for Six Sigma Certification Official Register. PLEASE NOTE: Prior completion of a Black Belt Level III Certification issued directly from the Council for Six Sigma Certification is REQUIRED for this registration. Enrollment for our Master Black Belt Certification has strict eligibility requirements. This payment option is ONLY for individuals that have met the necessary prerequisites. Orders will be voided if we are unable to match your Black Belt Certification III to your account. All MBB enrollments are manually verified.